With the launch of RethinkDB on Compose, you may wonder where to get started learning about RethinkDB. The RethinkDB creators have a wealth of tutorials and example content available and it's a great resource to get learning RethinkDB with. There are, though, one or two things that differ between running RethinkDB locally and RethinkDB hosted on Compose and we'd like to pick up on those differences so you can get up to speed with RethinkDB as quickly as possible. We're going to start with one of the more compelling RethinkDB tutorials - Analyzing presidential elections. Ah, excellent. You're back and you should have the RethinkDB user interface running in your browser now. The first part of the tutorial talks about importing some raw data into the "test" database of RethinkDB. We don't put a "test" database instance into the default Compose RethinkDB, so we'll have to create that first. Click on Tables in the top menu bar of the RethinkDB UI and at the top of the table (of tables) display will be buttons to Add Database and Add Table. Click on 'Add Database' and enter test as your new database name. Now we have a database, lets move on. The tutorial assumes you are running locally and have access to the rethinkdb command, specifically the rethinkdb import command, and that you can download some files from GitHub. Well, we don't have access to the rethinkdb command (unless you install RethinkDB locally which could end up being confusing) so we'll do all the importing through the Data Explorer, an interactive console into the RethinkDB system. and then hit the Run button. The r. is the anchor for ReQL commands and the tableCreate function is hopefully obvious in its purpose. It takes a new table name and then a set of parameters, in this case we set primaryKey to "uuid". 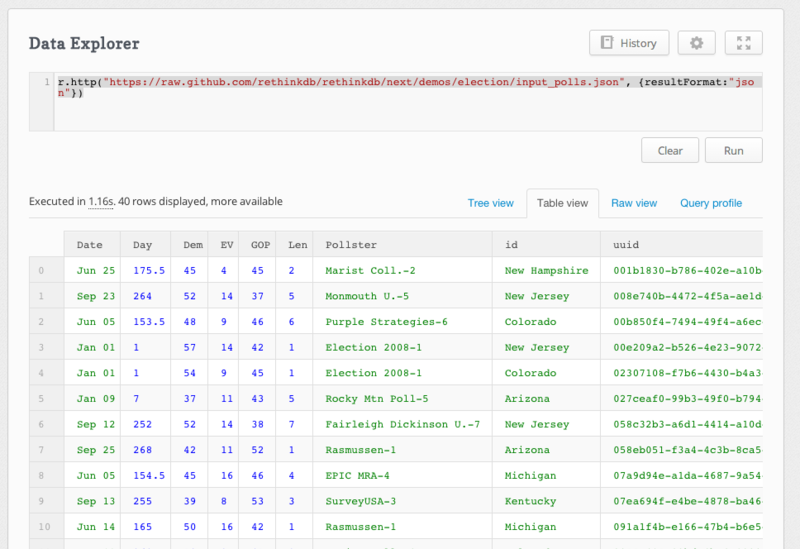 Click on Run and you'll get a view of the JSON data. 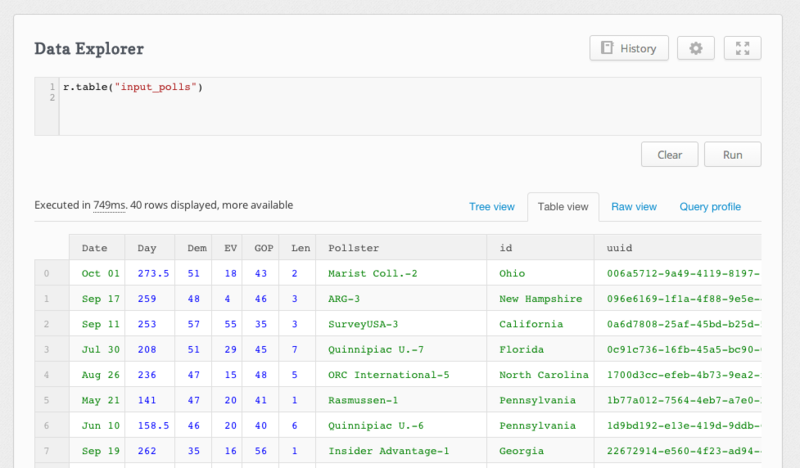 If you select Table View you can also see it formatted as a table. And with that data imported you can move on to the rest of the tutorial where you can discover RethinkDB's powerful join, function chaining, projections, grouping and more.